When I can’t sleep at night, I think about food. I analyze recipes I. scrutinize them. For whatever reason, I find comfort in this soothing mechanism because it tires out my mind. This isn’t something new; it all stared when my middle son was born. He had severe colic and screamed his head off from 6am- 6pm for six weeks straight. It was mental torture. I thought about food, bread, and chocolate to keep me sane. And so, this recipe was born in the wee hours of the morning (after the cat woke me up). I let him outside, and then made a pit stop to feed my sourdough starter before returning to bed. I would bake in the morning. This is sourdough noir. Bread… with dark chocolate. To begin, I added cocoa powder to my already existing recipe for country sourdough. This was the most basic (and boring) trial of the whole lot. 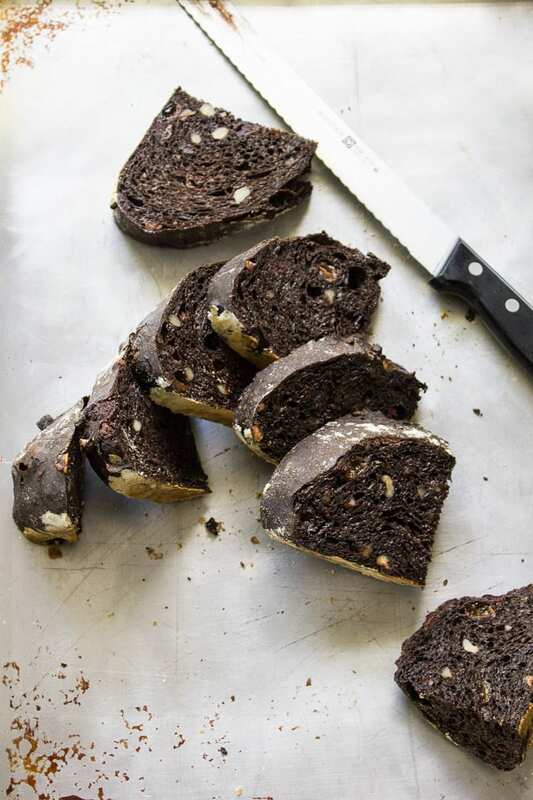 Just plain chocolate sourdough with nothing in it. Although the texture was nice it didn’t really taste like chocolate. Fail. 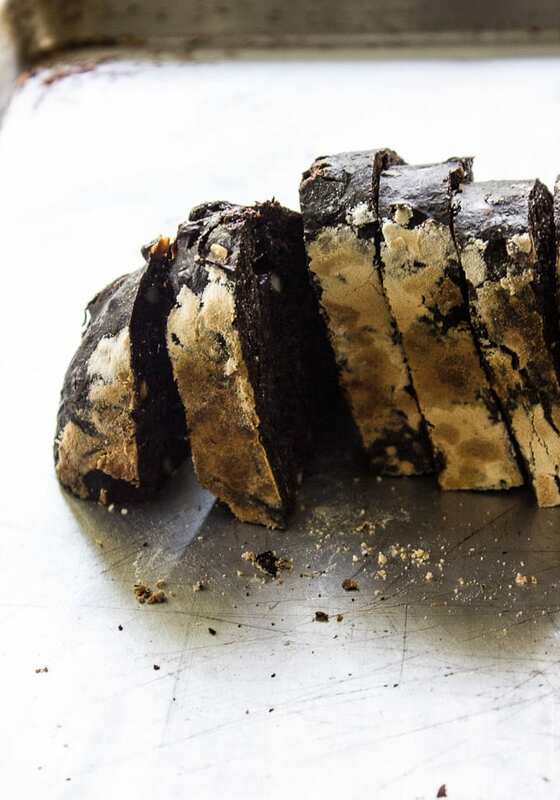 To elevate that chocolate-y flavor, I added chunks of good quality bar chocolate to the dough. Sounds like a good idea, right? Nope. It melted into the dough. Unlike chocolate chips from the bag, most bar chocolates do not have stabilizers to keep them from melting. That’s why the chocolate doesn’t melt in your cookies. Mental note for round 3. Score! The addition of chocolate chips meant chocolate in every bite while the dried fruit and nuts made it texturally interesting, at least to me anyway. I used a combination of raisins and walnuts. For my bread posts, I always like to include this in-depth beginner’s guide to sourdough for your reference. 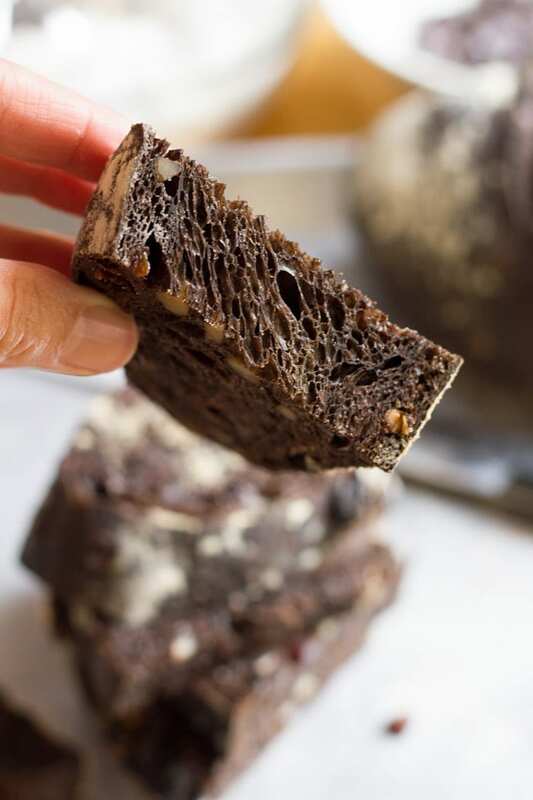 This chocolate sourdough is light and chewy with a soft crust. It is not sweet, just rich with chocolate flavor and a hint of crunch from the fillings. Try it cut into thick slices plain, or with a pat of creamy butter. I like it for breakfast with a dusting of powdered sugar over the top. Enjoy! You will need a heavy bottom pot or Dutch Oven for baking. This bread is best if consumed within the first 1-2 days. To freeze, wrap in plastic wrap and then in foil. It should last up to 3 months. All ingredients are weighed using a digital kitchen scale for best results. Make the dough: In a large bowl combine the starter, water, sugar and vanilla. Stir with a fork. Sift the bread flour and cocoa powder together and then add to the bowl. Squish everything together with your hands until all of the flour is absorbed. Cover with plastic wrap and let it rest (autolyse) for 1 hour. To the dough: Add the salt, walnuts, raisins and chocolate chips. Lift and fold the dough over itself several times and squish with your hands to incorporate. The dough will tear slightly as you fold and the salt will not fully dissolve. Don’t worry- this is normal. Work the dough as best you can until it comes back together into a rough ball. Bulk fermentation: Cover your bowl with plastic wrap and a clean kitchen towel. Leave it in a warm, sunny spot to rise. Your dough is ready when it no longer looks dense and has increased in volume about 1½- 2x its original size. This can take anywhere from 3-12 hours depending on the temperature of your ingredients, the potency of your starter and surrounding environment. *See note below. Stretch & fold: To strengthen your dough, do a series of stretch and folds every 30 minutes for the first 2 hours of bulk fermentation. Simply gather a portion of the dough, stretch it upwards and then fold it over itself. Rotate the bowl ¼ turn and repeat until you have come full circle. You will have completed 4 folds. Try to keep the fillings tucked into the dough and not on the outside. This will prevent burning when baked. Shape the dough: To cut and shape the dough, divide your work surface in half; lightly flour one side (for cutting) and leave the other half clean (for shaping). Remove the dough from the bowl and place onto the floured section. You do not need to ‘punch down’ the dough; it will gently deflate as you fold and shape it. Cut the dough in half to make 2 loaves, or leave it whole for a single loaf. 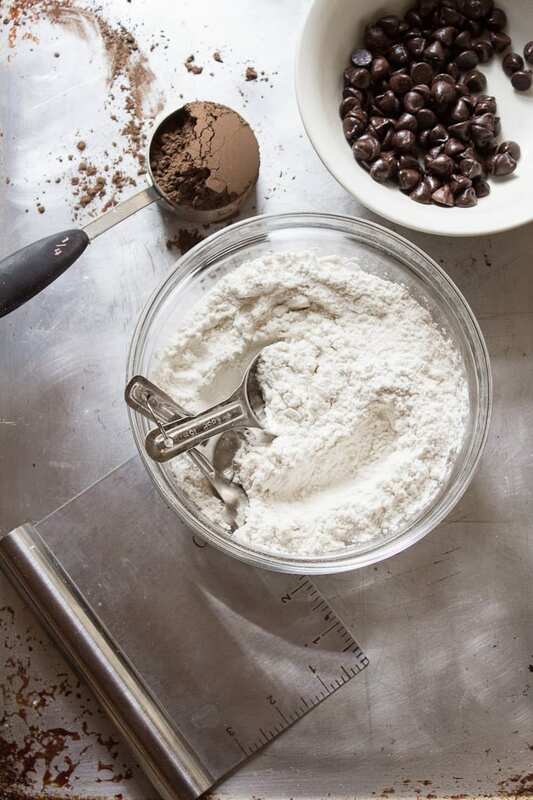 To shape, use a bench scraper to move your dough to the non-floured section (if there is any flour present it will be difficult to shape- brush away any excess). Gather the dough, one side at a time, and fold it into the center. Flip the dough over and place it seam side down. Using your hands, gently cup the sides of the dough and rotate it using quarter turns in a circular motion. You can also pull it towards you to even out its shape. Repeat this process until you are happy with its appearance. Second rise: Place the dough into a cloth lined 8-inch bowl, or floured/lined proofing basket. It will need to rise again, about 45 minutes to 1 hour. It is ready when the dough is slightly puffy. Preparing the baking vessel: Preheat your oven to 400F. Generously coat the bottom of a Dutch oven(s) with cornmeal to prevent sticking. Carefully invert the dough into the pot. Use your hand to gently guide it in. Slash the dough: Right before your bread goes into the oven, make a shallow slash about 2 inches long in the center of the dough. Use a bread lame, sharp pairing or serrated knife. Bake the bread: Place your bread into the oven (lid on) and bake for 20 minutes. Remove the lid, and continue to bake (uncovered) for an additional 40 minutes. During the last 10 minutes of baking, crack open the oven door. This allows the moisture to escape, leaving your bread with a crisp crust. You can also take the internal temperature of your bread to double check that it is done. For sourdough, it should read about 205 F.
Cool: Remove the bread from the oven, and cool on a wire rack for at least an hour before slicing. Because sourdough does not contain commercial yeast, it takes considerably longer to rise. In the summer months, it can take anywhere between 3-4 hours @ 85 F whereas in the winter, about 8-12+ hours @ 65 F. In the winter, I make my dough in the afternoon and leave it to rise overnight at room temperature. In the warmer months, I bulk ferment in the fridge to slow down the rise time. I should be sleeping yet now all I can think about is chocolate, fruit and nut bread… Sounds stunning! Wow, Emilie, you make my want to bake bread (and that’s big!) 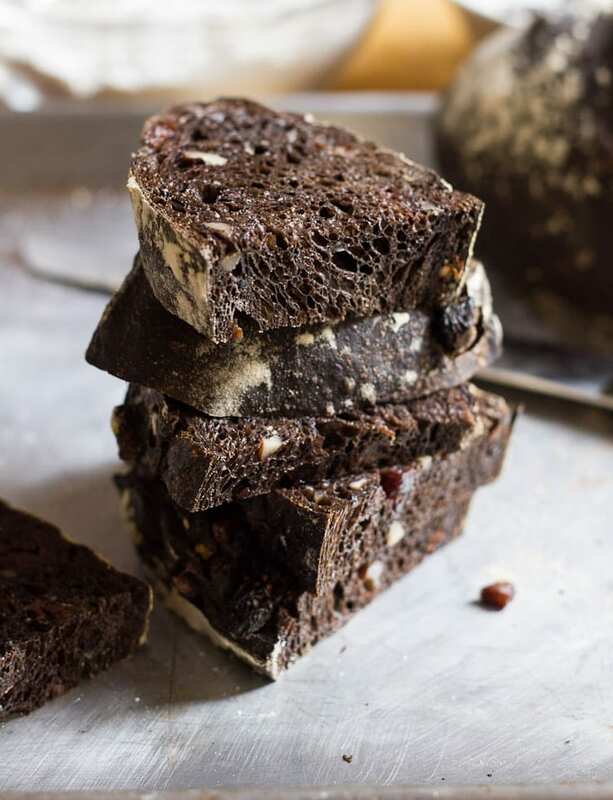 ~ when I first saw this gorgeous, dark loaf I assumed that it was rye (naive, right? ;-) ) — the chocolate brings it to a whole other level. So unique and what a treat – I would love this around the holidays (I would try a version with macadamia me thinks). Beautiful too. Please keep up your wakeful dreaming! I can empathise with you about your son and his problems with Colic. Even though my son is now 35 we went through a similar experience when he was a baby and honestly you really do think you are going mad. 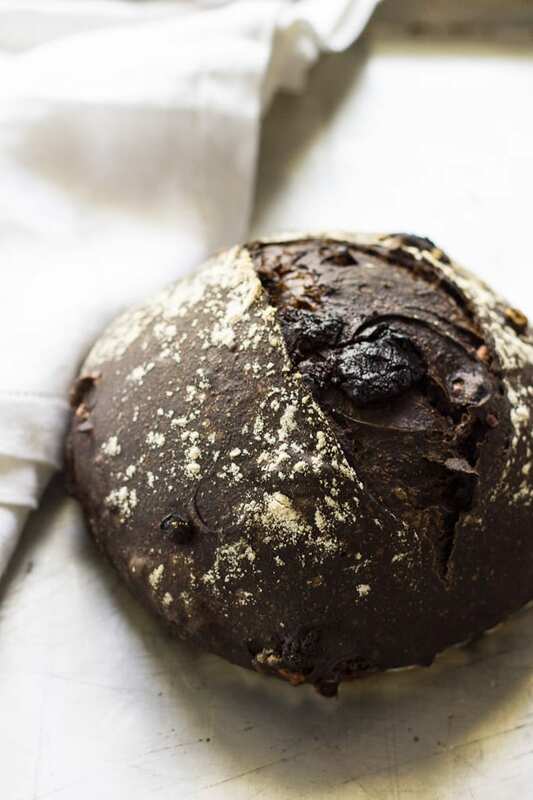 your sourdough noir is gorgeous and so so creative! 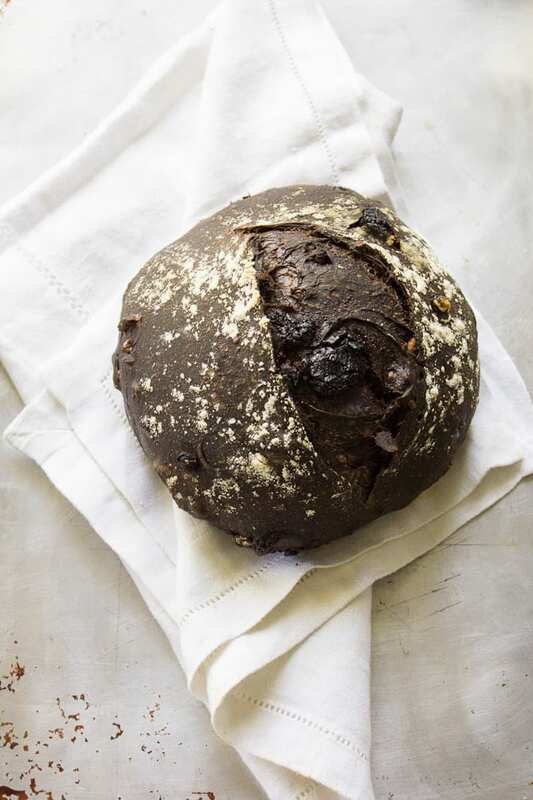 i love the idea of a dark “noir” bread born out of quiet moments late at night. This is so unique! What a creative idea and it looks delicious! You really are “clever”. I am a bread baker too. I have a sourdough starter that my friend made over 20 years ago and it’s still going strong. I can relate to getting up in the middle of the night to feed it. I look forward to trying your recipe. This looks completely delicious! Making bread is such a lovely ritual, and your beautiful loaf is just stunning! Welcome Christine! Thank you very much! I agree with you- baking bread is such a wonderful ritual, I am quite addicted myself. Are you a baker as well? Thanks Emilie :) I do love to bake, but it doesn’t necessarily come naturally to me. I often need to experiment before I’m satisfied with the results but the experimenting is part of the fun so it’s okay with me! This looks amazing. I love sourdough breads and chocolate just compliments the sourness. I bet it would be great with dried cherries. Pinned. Wow! 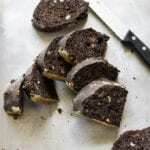 Rich, chocolately bread with nuts.. This is going on my baking list.. This looks seriously amazing. What’s the best way of doing this without sourdough starter. I appreciate it will change the taste a bit. This sounds fabulous, and your bread posts are truly wonderful. Congratulations on some really superior work. I Really Like Chocolate Chips.its so nutty and flavor full, thanks for sharing amazing recipe with us. This recipe looks really wonderful! I wonder, though, whether I might be able to adapt it to 100% whole wheat? I’ve been making all whole wheat sourdough for the past year, and am (finally) getting pretty consistently good results. I’m guessing the main difference would be that I’d need to do either some kneading, or more stretch-and-folds. Any experience/suggestions in this area? Although I’ve never tried this recipe with 100% whole wheat, I don’t see why not! 1.) Increase the autolyse period to about 1- 2 1/2 hours. This is important when working with whole grain flours. 2.) After autolyse, do a series of stretch & folds every 1/2 hour. This will strengthen the dough. 3.) Bulk ferment overnight (this eliminates the need for extra kneading). Because you have experience with whole wheat, you’ll know by feel if the dough needs extra water. Make adjustments to the recipe as needed if it seems dry. Also, I would soak the fruit and nuts during the autolyse period. I tried making this last night and it was so yummy and it looked pretty close to your pictures! I used parchment paper in my Dutch oven as I didn’t want to take the risk that the dough will stick to the bottom of my pan and it turned out very good, even better than the pain au chocolate that we used to get from our local grocery store! In your picture, there seems to be white/yellowish powder on the surface of the bread, is that from the powdered sugar or from the cornmeal? I just dusted it with AP flour just like when I do my regular no knead white bread. Also, how long can you refrigerate the dough and how long should I thaw it prior to baking? Thanks so much for the recipe! If memory serves me correctly, the white/yellow powder is a combo of flour (a little got on top before it was baked, then turned yellow as a result of the heat) and the white is powdered sugar. The length of refrigeration will vary. I won’t let it go longer than 2-3 days. It’s rising strength will all depend on how powerful your starter is; mine is resilient! You might have to play around with this depending on your starter type. But for the modern schedule, it’s nice to have dough in the fridge ready to be baked when time permits. When you do take it out of the fridge, let it ‘thaw’ for at least an hour (time will vary as the weather begins to warm up- still snowing here). I find that baking room temperature bread yields lighter and fluffier results than cold bread, although professional bakers bake cold all the time. Just my preference! Thank you for sharing this gorgeous recipe! Inspired by your bread I made my own version of the recipe. I didn’t have the required amount of chocolate so I substituted the lacking amount with white chocolate (maybe a quarter of total amount) that I happened to have in my cupboard. Pecans instead of walnuts. Honey instead of sugar. 100 g of the flour I used was emmer wheat. And I made two small loaves and baked them on a pizza stone. It turned out great – and very chocolate-y! Yum!! 1) Can you skip the sugar altogether? Or does that make the taste of cocoa overwhelming? 2) Can you also skip the chocolate chips? 3) Can you make this with 100% all purpose sourdough starter instead of doing the 50/50? Thank you so much! Can’t wait to try this on the weekend. That’s fantastic- I’m so happy to hear that! Isn’t baking bread something truly special? For this recipe, I wouldn’t skip the sugar. The bread is not sweet; it just offsets the cocoa. You can experiment with different kids of sugar, if you’d like. 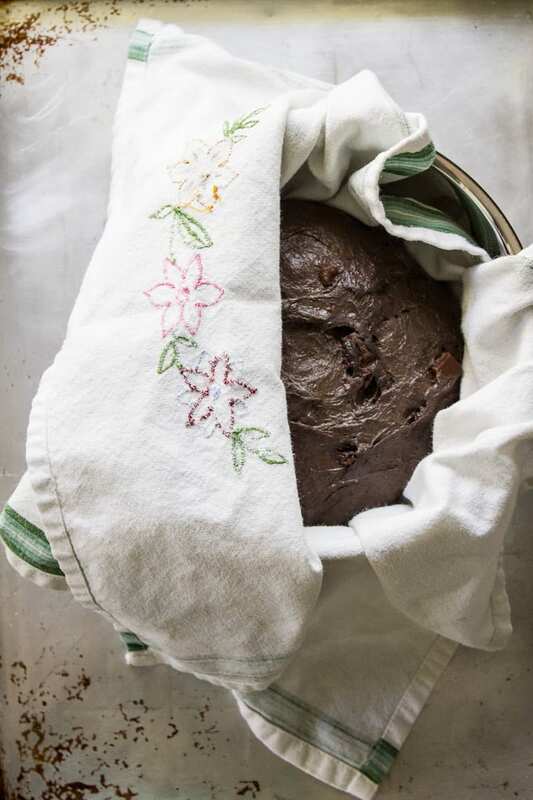 You can definitely skip the chocolate chips, but it really adds dimension and textural interest to the loaf. Plus, it brings out the cocoa flavor. Perhaps use a little less than skip it altogether. And for the starter, it’s totally fine to use what you have. Quick question – is the baking time of 20 covered/40 uncovered for the single large loaf? Or is it about the same regardless of the size? It’s the same baking time (covered & uncovered) regardless of size! On the second rise, I usually let it rise in my baking vessel. Should I not? What is the benefit of the second rise in the cloth lined basket vs. what it will be baked in? Is it to prevent sticking? I am looking forward to this bread tomorrow! Generally speaking- the second rise can be done either way depending on the type of dough you are working with. For example, in comparison to the original sourdough bread (the one you’ve been baking) this chocolate dough is particularly wet. It contains 100g more water. Wet doughs tend to spread out to the sides when rising. They’re still rising, just in a different manner. Therefore, the benefit of a cloth lined basket or banneton is that it will contain the dough’s shape during the second rise. Doing the second rise in your baking vessel is not preferred because it will spread too much, yielding flat bread. Does that make sense? Hope this helps! I made this yesterday and today with the following variations: I used dried cherries soaked for an hour or so in hot water, toasted pecans, Guittard dark chocolate chunks, and Dutch process cocoa. I also doubled the recipe and used some of the soaking water for the hydration. My husband is ooooing and aahhhhing right now over his decadent toast! Thank you for such wonderful inspiration! Thank you! This recipe has my friends crazy about it and asking for more when I baked it. Thanks! I almost wished you’ll have another sleepless night and come up with another brilliant recipe! 1. Can the starter be directly from the fridge? Or do u feed it till u have 150g to start with? 2. Can I just use a normal tray to bake this? Is a Dutch over completely necessary? 1.) For best results, your starter should be at room temperature before using. Feed it until it’s bubbly and active, then measure out 150 g for your recipe. 2.) You can use a normal tray, but you’ll need to create steam. All ovens are different and without added moisture, sometimes the crust will set too quickly which can hinder the rise of your bread. Try it and see how it goes. OMG! So glad that,I finally made this! SPECTACULAR! This is the only sourdough noir recipe I use. I use my base recipe for the sourdough and then add all the extras. Comes out amazing. Great recipe, especially the sourdough starter basics guidance. I admit upfront that I really dislike people leaving ratings or likes/dislikes when they don’t follow the exact recipe, at least at first. I am about to this anyway. I made one modification on this recipe and if it didn’t turn out well, I would have redone with exact recipe first but it is quite yummy so am happy to report that I replaced the full anount of filtered water with equal amount of Guiness stout. It worked out great and gave an additional malty taste to complement the chocolate flavor so I would highly recommend it. Of particular note, I didn’t have the dark cocoa so the stout boosted the desired dark coloration as well as the additional bitterness. One question, the Dutch oven, what does it do? I have one but Ive never used it for bread. Whats the gain of using one over just chucking it on a stone? A Dutch oven creates steam for the bread to rise. Because all ovens are different, and some hold steam better than others, using the Dutch oven eliminates any potential variables. If your bread comes out just fine on a pizza stone, you’re good to go! However, if you do have a Dutch oven or a similar oven-safe pot, I encourage you to give it a try; the results are excellent. This looks excellent! Going to try a variation of this for a mother’s day loaf. Will replace the raisens with sour cherries, replace sugar with less honey, and add some espresso powder to the recipe. Thanks for the inspiration. Wish me luck! Can u use regular cocoa with a pinch of baking soda instead of Dutch. I can’t wait to try this recipe. Autolysing is the process by which the enzymes (amylase and protease) in the flour activate in water and break down the starch and protein. If you want better results, don’t let anything interfere with that process – not cocoa, not sugar, and especially not yeast (or starter) because it will start feeding immediately. Mix ONLY the flour and water and let it autolyse for at least one hour and optimally two hours. Also, look into what diastatic malt powder can do for your breads. You can make your own by sprouting, drying, and grinding wheat or barley. Hi there! You know, I used to follow the same method (adding additional ingredients only after autolyse). And as you’ve mentioned above, and I experienced good results. However, as my journey progressed my method changed to suit my schedule, hence the different instructions here. But that’s what I love about sourdough! It truly is a flexible craft and it encourages conversation and sharing. Thank you for sharing your tips here! PS: I’ve played around with diastatic malt too. It sure does make a notable difference! I am new to Sourdough baking ( my starter is about 4 weeks old) So far I have baked several things with my sourdough but this recipe by far is my favorite! I couldn’t even wait for it to cool completely (did give it 30 minutes) Thank you so much for the wonderful directions and helpful hints. I read them all! so blessed to have found your site! by the way…made mine with sliced almonds and semi-sweet chips. It is yummy! I do have a question and would like your suggestion, I use my cast iron enamel pot as directed and some of my loaves are getting really dark on the bottom. I wouldn’t call it burnt, but overdone. What do you suggest to remedy that? Thanks again! Can’t wait to try this! Can I assume you dutch oven is cold when you put the dough in? Thank you! Hi Judith, yes! The Dutch Oven is cold when it goes into the oven. Some bakers preheat their pots, and I’ve done so in the past, but I no longer do it now. I get excellent results this way! Can the dough be placed in the fridge for the second rise? if so, for how long? I’m so excited to try this, but a quick question: do you bake the half-loaves for as long as a full loaf? Emilie! You book and blog have been a godsend for this newbie sourdough baker. I’ve made so many loaves of your everyday bread in the past month, I’ve lost count. I can’t wait to try this recipe, but I’m wondering if you’ve ever made a chocolate starter and then baked a loaf of bread from there? I read about a chocolate starter via Vanessa Kimball and I’m sort of intrigued. It seemed easy enough to create one, (replace 20% of the flour with raw cacao powder) but now I’m wondering if I can use a chocolate starter for your basic bread recipe? My gut tells me it wouldn’t taste all that different, but would love to hear your thoughts. Thanks for all your information! You’ve done a great job at simplifying sourdough mysteries and I’m grateful.